She describes herself as ‘nobody special’, saying, ‘I am simply me…Yasmeen.’ Yet Yasmeen Premji has achieved much in her life. This unassuming woman has rarely made herself known in the media though she is the wife of one of India’s leading businessmen, Azim Premji. Her husband may be chairman of the Wipro company and renowned for his philanthropy, but Ms. Premji holds her own as a woman of substance. Always a brilliant student, Ms. Premji managed to top St. Xavier's College, Mumbai, obtaining the highest marks in psychology at Bombay University. She then completed her Master of Arts degree from Smith College, U.S.A., on a scholarship. But her proficiency was not limited to academics. 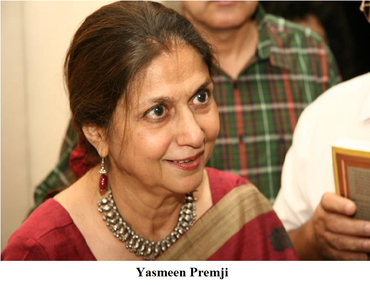 Ms. Premji has been an avid sportsperson. At her school, Queen Mary’s, she participated in basketball, athletics, table-tennis, chess and hockey, and was appointed games captain too. It is not surprising that hockey remains high on her list as she has represented her college and state in this sport. Ms. Premji grew up in a liberal minded family where boy and girls were treated on an equal footing. She strove to experience life in a way most young women of her class and era might not have. She backpacked across Europe defying restrictive norms of society and her grandmother’s protests. After she came back from the trip she entered into the married state with Azim Premji. It was a simple affair with the wedding gifts given away in charity. The love of writing was sown at a young age by her mother. During her teens she wrote some short stories that were published. However it is only now the flourishing plant has emerged as the author of a well-received novel. Ms. Premji gives us the gist of the novel, ‘Days of Gold and Sepia is a rags to riches story, the saga of a young impoverished boy, who at 16 walks all the way from his homeland of Kutch to the vibrant city of Bombay in the summer of 1877, and goes on to become a 'karodpati', a cotton king in the city of white gold. 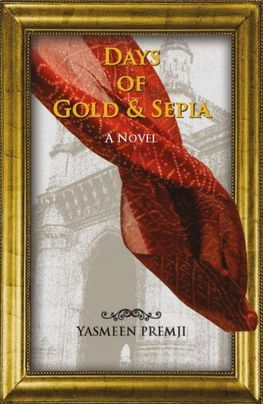 In the unfolding of Lalljee's colourful life, you get a rich glimpse not only of old Bombay, but also of the fascinating period that was India between 1857 and 1947.’ In its title is borne a summation of the novel with ‘Gold’ signifying a man’s pursuit of gold and ‘Sepia’, the colour of old photographs, reflecting the feeling of nostalgia that wafts through this tale of a time past. The novel was born out of family stories she had heard of the old days. Her own grandfather had come down to Bombay from Kutch in the late 1800s. She admits true life incidents have in part influenced the book. But she asserts that Lalljee Lakha is not based on any one character but is his own person and it is his story that she tells. The future may not see any more novels from this first time author. Ms. Premji quite candidly states, ‘Even if I had another book in me, I doubt I have another 20 years to write it in.’ Even so, she has palpably demonstrated age is not a factor that should hold anybody back from reaching a goal.